Patient Intake Coordinator ~ Sarah recently moved to Clarksville from Ft. Rucker, Alabama in August of 2017 and joined the High Pointe team just days after. You will find her smiling face downstairs in the Pediatric clinic playing with all the fun and cute kiddos. 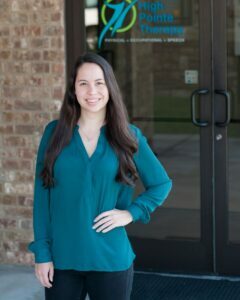 Sarah handles incoming referrals and will be happy to schedule you (or your child) for the initial visit and ongoing care. Sarah spent much of her life in Hawaii but also lived several other places due to being in an Army family. She attended school at King University in Bristol, Tennessee where she swam all four years and graduated in 2015 with her Bachelors in Psychology. Sarah lives with her boyfriend Aaron and their dog (Rambo) and cat (Keeda). When she’s not having a blast with the amazing kids in our clinic, you can find her hiking with her boyfriend and dog, eating delicious food, swimming, or traveling to some new place and going on new adventures. She loves everything to do with being outdoors and plans to visit every beautiful waterfall in Tennessee!